There's nothing more calming than some free time on the Amish Made Western Red Cedar Marlboro Swing Bed. The Marlboro makes your down time a true delight, with a spacious and supportive bed built right into your porch or patio scene! Equipped with color and comfort for the whole family, there's room to relax, read or search the night sky together. 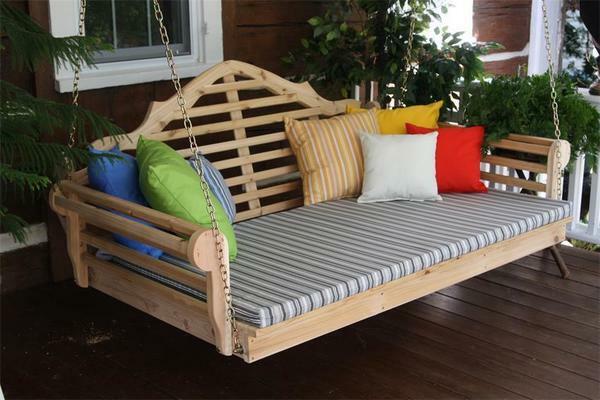 Get some popcorn or ice cream ready and head outdoors for fresh air and the fun of a swing bed on your porch! This cedar outdoor furniture is handcrafted by the Amish in Pennsylvania. Woods for this outdoor furniture are sourced here in America, providing you with an American made swing bed you can be proud of. For more outdoor furniture options like the Marlboro, be sure to browse our Amish Garden Furniture Collection. Western Red Cedar Wood looks beautiful while it works hard for you. Your cedar outdoor furniture is built to last with natural characteristics contributing to its durability. For your porch or patio or perhaps for your business entrance, the Red Cedar Marlboro Swingbed will gain attention with its attractive style. Create the version you're looking for with custom made options available.